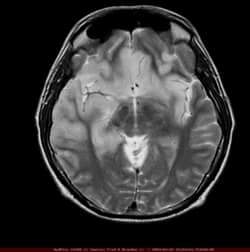 Definition : encephalitis is inflammation of the brain tissue . fungal, viral etiology is the most common. Transmission : (1) Person to person : e.g. Herpes simplex ,varicella zoster ,measles ,mumps, influenza viruses,enteroviruses, ,adeoviruses . (2) Spread by mosquitoes or ticks: e.g. jabanese B, Dengue fever,West nile virus encephalitis (3) Spread by warm blooded animals e.g. Rabies encephalitis . The history can provide useful clues to the etiology ,never accept that the history is not available for a confused patient also comment from relatives that a patient does not seem right should not be ignored ,ask about recent rashes,ask weather others in the family or in the community have been affected .parotid swelling,testicular pain or abdominal pain due to pancreatitis may suggest mumps encephalitis ,travel history is important Clinical picture : altered level of consciousness ranging from mild lethargy to coma ,focal or generalized seizures may occur . Examination : assess degree of coma ,examine the skin for rash,bite,injection site ,examine the genitalia for ulcers or vesicles (Herpes simplex virus type 2),examine the inside of the oral cavity and the sides of the tongue for evidence of previous convulsion ,Look for focal neurological signs or flaccid paralysis ,look for tremors or invoulntary movements ,examine the pupils for size,reactivity,and equality on both sides ,fundus examination for papilloedema , look for signs of cranial nerve affection .